John Boots is a 92-year-old Louisiana man who is the current world record holder for the fastest indoor two-mile time in the 90-plus age group and affirms that his best days are ahead. 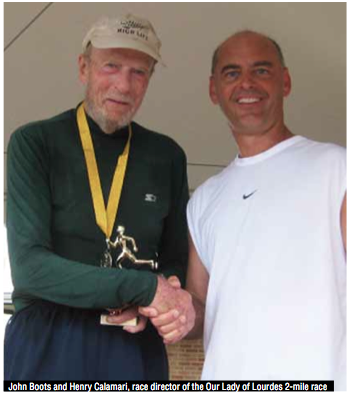 New Orleans Living magazine was fortunate to have the chance to sit down with Boots and his trainer, Rob Braniff, to find out just how this middle distance runner does it. Boots started running for fitness when he was about 55. “I had a physical exam for a company I worked for and the doctor said I was headed for heart trouble and needed to get in touch with a cardiologist,” Boots says. Immediately, Boots began reading up on heart conditions, decided to lose weight, stop drinking coffee and get more exercise. He began running after work and on weekends and soon began competing. “I ran the corporate cup 5K race and nothing spectacular happened, but I enjoyed it,” he says. He ran another 5K race for a charity and shortly after got something in the mail about another race and ran that one too. “I improved my time by four minutes so that gave me a clue that maybe I was good at running,” says Boots. He went on to buy a pair of shoes and saw an entry form for a masters regional meet in Kenner. “I thought, ‘I never ran at a track meet’ so I would go into that and I came away with first place in the 1,500, second place in the 800 and third place in the 5K,” he says. Boots’ goals were not going to stop there. One day Boots walked into Slidell Athletic Club looking for specific equipment and training space. “Just striking up a conversation with him out on the floor, it became apparent to both of us that I could help him to reach further goals,” says Boots’ trainer, Rob Braniff. Braniff describes his first impression of Boots as a fit, active senior who ran and wanted a competitive edge. Braniff’s philosophy as strength and conditioning trainer is to push past comfort zones, but he knew Boots’ situation would be a little different and he found he would need to be more tailored about his plans. “As you become older, you can end up needing more help in areas of core strength, core stability, flexibility, balance and functional strength, and you do not really arrive at that with traditional training equipment,” says Braniff. He knew training with Boots was going to be uncharted waters. “I do not know how many people can say they train 90-plus-year-old individuals that run competitively, so that was interesting for me,” Braniff says. The program Braniff used was mostly the TRX training system. “The TRX is essentially nylon straps fixed to a point with handles on the ends, where either your hands or feet go into them and you more or less hang with one body part on the ground and one holding onto the handles or foot cradles,” says Braniff. Exercisers can use different angles to create an increase or decrease in resistance using their body weight. “Boots’ exercise prescription incorporates dynamic stretching or stretching with movement, a joint warm-up phase and a dynamic exercise phase, which includes core strength, core stability, flexibility and balance,” says Braniff. There are five components of fitness Braniff encourages. “In no particular order, they are nutrition, dietary support, cardiovascular training, resistance training or weight training, and personal assistance,” Braniff says. He suggests exercising for 30 minutes a day five days a week doing moderate cardio, which is equal to walking briskly. He also recommends adding a three-day minimum of resistance training or weight training each week and then tweaking how you look at food. “You should be well-balanced between carbs, proteins and fats and eat frequently so you raise your metabolism and boost it to burn more calories,” he says. Since having a trainer, Boots took three medals in the USA track and field masters national championships in Houston. At 66, he was No. 1 in the country in his age group. “I ran in an international meet in Rome, Italy, and came in third in the 1,500 there so I have been a 1,500-meter specialist ever since,” says Boots. For Boots, his victories were a gradual progression. “Most of the years I was ranked No. 1 in my age group, whatever age group that happened to be. I started off in the 60 to 64; then I ran in the 65 to 69; the 70 to 74; the 75 to 79; the 80 to 84; the 85 to 89; and now I am in the 90 to 94,” he says. Boots says he has been able to survive to 92 in fairly good health and offers advice on how others can do the same. “Have some physical activity whether it is bowling, tennis, golf or walking,” he says. Boots says he thinks it is important to exercise and get your pulse rate up instead of watching television or reading. Staying fit has provided great benefits for Boots. “I believe being physically active has helped me not only in my general health but in my mental ability and keeping alert,” he says. His name is definitely one that you will want to look for in the local news, as his record setting is far from over.